Our introduction to scrambling course is for the competent hillwalker who would like to venture into more exhilarating terrain. We will provide you with the confidence and skills to undertake Grade I scrambles – ones that can typically be attempted without ropes or equipment. We will be mostly looking at building up your confidence on scrambling terrain, with easy route finding, and the occasional difficult steep steps. Most of these tend to be straight forward. 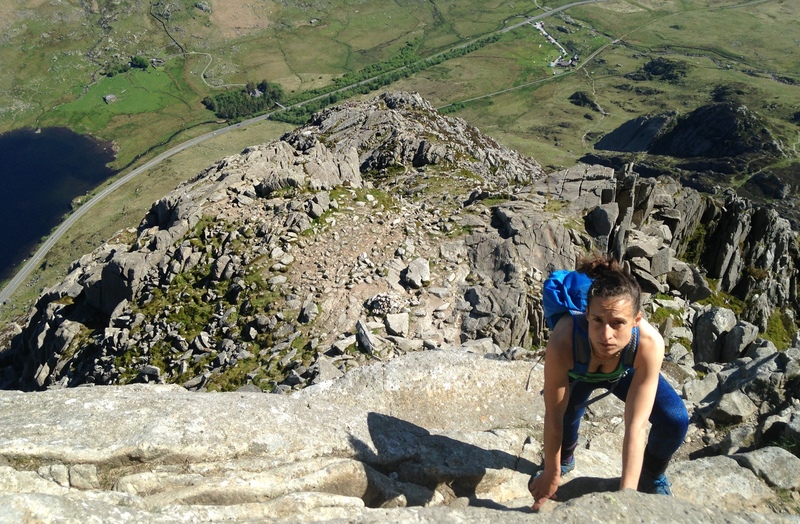 Some of the infamous scrambles we may be attempting on the introduction to scrambling course would be Crib Goch, Tryfan, Bristly Ridge, Jack’s Rake, or Striding Edge. The course is 2 or 4 days long, and is run in North Wales or the Lake District. Our client-to-instructor ratio does not exceed 4:1, so that we can give you our fullest attention. You should have some hillwalking experience; basic map-reading skills would be useful, but are not essential. If in doubt about whether the course is suitable for you, please don’t hesitate to contact us. Each day of our introduction to scrambling course we would introduce the topic of weather, and ability, and how this would affect venue selection. We will introduce the use of a map and compass, and what sometimes can be complicated, route finding. We will be scrambling up grade I terrain, and occasionally at the introduction of a rope, and when this can be useful. We will be using the skills learnt on day one, and do lots more scrambling over grade I terrain. Looking at efficient movement. If you are unsure that the introduction to scrambling course is suitable for you, please do not hesitate to contact us on info@riseandsummit.co.ukor call us on 07775 853 348, and we would be happy to help.